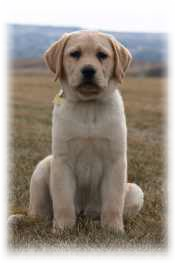 If you are interested in learning more about Labrador retrievers and the standard to which we are breeding in the LRCC Inc, please go to this page - Canadian Labrador Retriever Breed Standard. That darling little bundle of fur is going to grown in leaps and bounds into a large (65 to 90 lb.) dog, which hopefully will be part of your life for the next ten to 14 years. This should never be an impulse purchase, so avoid pet stores. Do your research and take time to consider all aspects of the breed. Review the Canadian Kennel Club on-line breed standard or visit your local library for more detailed information. Visit one of the many Canadian Kennel Club events held throughout Canada each year to experience the breed and talk to breeders and owners about the breed. One advantage of purebred dogs is that the qualities of each generation (size, coat, temperament, etc.) are passed on to the next. All breeds of dogs are different. X-rayed clear of Hip Dysplasia and Elbow Dysplasia, and should be certified by the Ontario Veterinary College ("OVC") or the Orthopedic Foundation for Animals ("OFA"), or Penn Hip. Ophthalmologically examined and certified clear of hereditary eye diseases when possible. A blood test for PRA by Optigen is strongly recommended. Dilute-free. 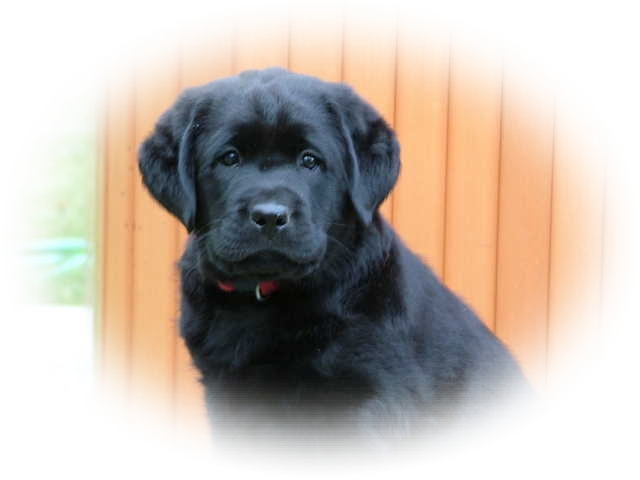 Breeders will make all reasonable efforts, including dilute gene testing, to avoid purchasing, producing or allowing their stock to be used to produce dilute affected (dd) or dilute carrier (Dd) Labradors. Offspring of dilute-free (DD) parents will be considered clear by parentage. Temperament:determines obedience needs, level of independence or attachment, aggressive/passive nature, etc. Allergies: some breeds cause less suffering for allergy patients. Seriously consider whether you have the time necessary to raise a puppy. Do you have other more pressing considerations, i.e. small children, full time employment. 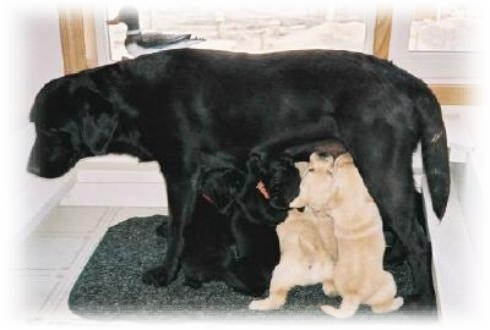 Puppies require a tremendous amount of social contact and direction to meet their full potential. 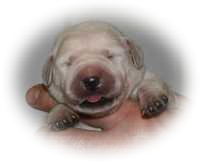 Visit a number of breeders and compare the dogs, the facilities and the breeders. Make your final purchase from someone you are comfortable with and who you feel you can rely on beyond the day of purchase to be as concerned about your puppy’s future as you are. Talk to honest, reliable breeders. They will be happy to inform you of qualities, both pro and con. 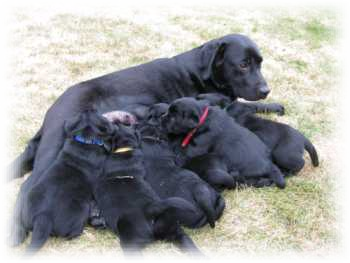 Labrador Retrievers come in three recognized colours - black, yellow (fox-red to light cream) and chocolate (ranging from light sedge to chocolate). They are NOT silver or white. Remember, a puppy is not a child in a fur coat! 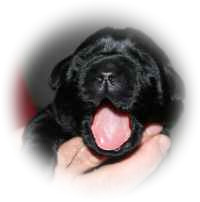 A Labrador puppy requires a certain amount of exercise each day. When they are little you must be careful not to over-do this. 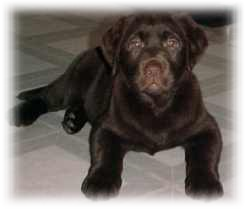 Remember that a Labrador puppy isn’t fully grown until over a year. Keep in mind that the activity should not be overly strenuous, in order to prevent bone or joint damage. A good rule of thumb is best to be on the cautious side until fully grown. For young dogs, twice daily exercise is a must. Retrieving a small bumper (dummy) several times is always a good exercise for a Labrador puppy. Just remember - Do not let him chew the bumper. Never play tug-of-war! Please do not throw a Frisbee for your pup or older dog. Back injury can occur and you do not want that. Do not take a puppy jogging and certainly do not use a bicycle to exercise your puppy. Spending time now on developing constructive play will help prevent problems from developing in the future. You have now decided you would like to have a Labrador puppy in your life. This can be a wonderful, rewarding experience. Picking an honest, reliable breeder is your next goal. Your local kennel club may be able to direct you to responsible breeders. 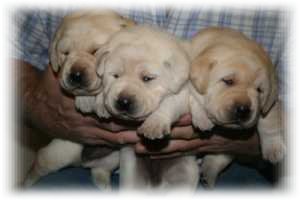 Certainly the Labrador Retriever Club of Canada Inc can help you. Always visit the kennel, if at all possible. Ask to see the parents, if possible, if not photographs. Confirm Canadian Kennel Club registration of the parents, the litter and the puppy you are about to purchase. What titles, if any have the parents earned. You may wish in the future to show or trial your puppy. Ask to see all clearances on both the dam and sire, i.e. hips, eyes, elbows, heart. Any responsible breeder will be pleased to show you these clearances. If there is reluctance to show these, consider another breeder. At least a three generation pedigree of the pup should be available. You may be lucky enough to see some of the dogs in the pedigree and if not probably pictures. 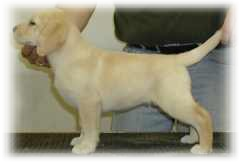 Some breeders have picture pedigrees which will give you a fairly good idea of what the pup will look like. -Will the breeder be there for you when you are in need? -Confirm that the puppy has been permanently and uniquely identified. -Will the pup be vet checked prior to pick-up. 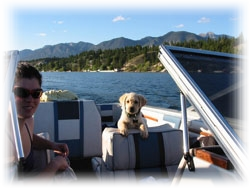 The breeder must supply you with an individual Canadian Kennel Club registration, at no cost to you, as outlined in the Government of Canada’s Animal Pedigree Act. Note, this may take several weeks to arrive. The breeder will also supply you with the pup’s medical record and it will be up to you to keep your pup’s medical shots up-to-date. Most breeders also supply their puppy people with a booklet of information, i.e. feeding instructions, sleeping suggestions, a list of informative books, possibly food for the first day. They will hopefully suggest a reputable puppy class and recommend an obedience school for when the pup is around six months old. Ensure that you comply with the local by-laws regarding leashing, noise and number of dogs allowed on your premises. Check license requirements in your local area. Whether there is a by-law existing or not, religiously adhere to the “poop and scoop” principle. Never allow your dog to run loose in a park where children are playing, even if it is designated as an “off- leash” park. Enroll your dog in obedience classes. A well-trained dog makes a great neighbour. You can start with Puppy Kindergarten or if that is not available in your area, the Beginners or Novice Class. Last, but by no means least, have fun with your new puppy. We hope that this wonderful new addition to your household will bring great joy and happiness to you and all of the members of your family for years to come. Contact a Club Member closest to you or the Regional Director closest to you for a referral to a member breeder. these can be used for personal websites as well as Labrador Breed Club websites. 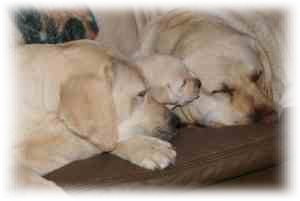 Please click here for additional information about buying a lab!